Click the image above, for upcoming meetings and events in Keego Harbor, Orchard Lake, Sylvan Lake, and West Bloomfield. 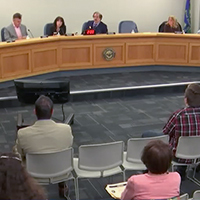 Click the image above to view the April 11, 2019 Cable Commission meeting. Click the image above to meet our valued partners. Click the image above, to participate in a survey regarding Civic Center TV and cable service in Greater West Bloomfield. Click the image above, for information regarding the Commission’s support for open and transparent government. Welcome to the web site of the Greater West Bloomfield Cable Communications Commission. The Commission hopes you find the information included here to be of value to you as a resident of Keego Harbor, Orchard Lake, Sylvan Lake, or West Bloomfield and/or an AT&T or Comcast cable subscriber. Is a service of the Cable Commission, providing live and on-demand meeting coverage and community programming and information on Comcast (channel 15), AT&T (channel 99), and on the internet. Go to civiccentertv.com or click on the logo in the upper right hand corner of this page.